Ja załapałem się na jeden. ARISS Russia is planning Slow Scan Television (SSTV) image transmissions from the International Space Station. The transmissions begin Thursday, April 11, 2019 around 18:00 UTC and run continuously until approximately 18:00 UTC on Sunday, April 14, 2019. This event uses a computer in the ISS Russian Segment, which stores images that are then transmitted to Earth using the ARISS amateur radio station located in the Service Module which employs the Kenwood TM D710E transceiver. Once these images are received by ham radio operators and other radio enthusiasts on Earth, many participants will post them for viewing at http://www.spaceflightsoftware.com/ARISS_SSTV/index.php . In addition, you can receive a special SSTV ARISS Award for posting your image. 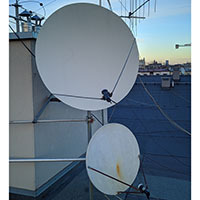 Once the event begins, see details at https://ariss.pzk.org.pl/sstv/ . The transmissions will be broadcast at 145.800 MHz using the PD-120 SSTV mode.